Chow Down Seattle: Happy National Coffee Day! 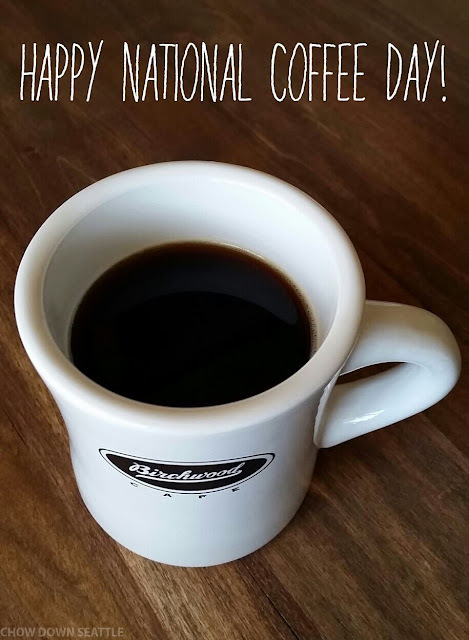 In honor of National Coffee Day, you can enjoy some of these great deals at your favorite coffee retailer. Dunkin' Dounuts: Get a free medium cup of Dunkin' Donuts hot or iced dark roast coffee. Limit one per guest, and is available at participating locations. Peet's Coffee and Tea: Get a free small cup of Peet's Major Dickason Blend with any purchase of a baked good, oatmeal or fresh food item. Krispy Kreme: Get a free small coffee and an original glazed donut! Tim Hortons: Get any size coffee in Regular or Dark Roast for just $1 at participating U.S. restaurants. Whole Foods: The grocery store is celebrating all month long with 25 cent cups of 12-ounce coffee. Caribou Coffee: Coffee with a cause. Instead of giving people free coffee, for every cup of Amy's Blend purchased on Sept. 29th, Caribou will donate a cup of coffee to nurses and families in cancer centers throughout the country. Enjoy your day with a good cup of coffee! I love Caribou's tagline....Life is short. Stay awake for it. Fresh-roasted coffee that is artfully prepared in small batches by a skilled roaster. This gives the coffee a unique quality. We happen to meet a great people there and started to chat with them and drink w/them too. I had a great time here, glad we found this place by accident. Will definitely come to venues in Atlanta again as anyone will make this a regular spot easily.